Obituary for Lucille Mae Riggins | Langeland Family Funeral Homes, Inc.
Lucille Mae Riggins, age 88, died on Saturday morning, April 21, 2018 and went to be with her Lord. She was born on November 16, 1929 in Paris Township, MI a daughter of Barton L. and Bertha C. (Hout) Fairbairn and lived in the Kalamazoo area for most of her adult life. 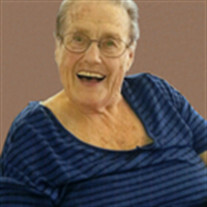 Lucille was a member of Kalamazoo First Assembly of God. She adored her family and her life revolved around them. Lucille was preceded in death by her parents; three sons, Darrell Lee, Phillip James and Peter Eugene Riggins; and four sisters. On June 19, 1948 Lucille married Eugene Riggins, who survives. Also surviving are two daughters, Jean Prescott and Kimberly (Phill) Mansfield; two daughters-in-law, Jan and Lillian Riggins; many grandchildren, great-grandchildren and great-great-grandchildren; two brothers, Leroy and Zane Fairbairn; and many nieces and nephews. Visitation will be held from 5pm to 8pm on Wednesday, April 25th at Langeland Family Funeral Homes, Westside Chapel, 3926 South 9th Street where services will be held at 1pm on Thursday, April 26th. Interment in Mount Ever-Rest Memorial Park, North will follow services. Memorials may be directed to the American Cancer Society.